Most days life runs smoothly. I'm a normal person who does normal things. But every now and then life throws me a curve ball. It came on Friday. With a message on my phone. I'll start with my dad calling, oh wait it wasn't Dad. Mom's voice on the message telling me Dad had a heart attack and was in the hospital. 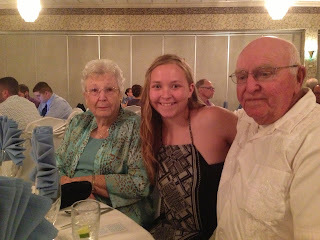 Mom, my granddaughter, Megan, and Dad, Aug. 8, 2014. We were at a family wedding. The good news is Dad had two stents put in. He has one completely blocked artery. He needs two more stents probably on Tues. Expected to be back home by Friday. In the meantime, my sister, Diane has been on site and keeping the rest of us informed. These are the times I hate being so far from home. I know it bothers Dean and Nancy both being so far away. Sending prayers for God to watch over him. And trying to keep busy.